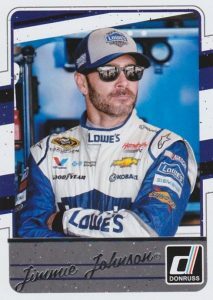 Ushering in year two of the Panini license, 2017 Donruss NASCAR Racing applies the old-school brand to the top names in the sport. Two relics and one autograph fall in every hobby box. In addition to the base set and Rated Rookies for young stars, Retro Variations features the 1984 Donruss design for select subjects. Retro Signature Series inserts build on this with autographed versions of the subset. 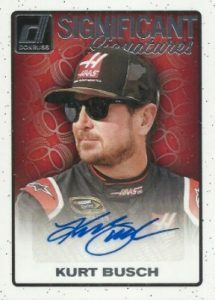 2017 Donruss NASCAR Racing also has several other autographed choices, including Significant Signatures, for retired greats and current stars, as well as Rubber Relics Signatures that adds a tire swatch with an autograph. Both of these have base versions and parallels limited to 25 and one-of-one. 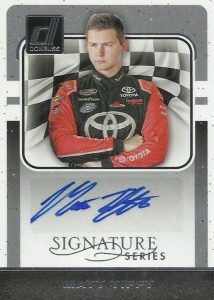 Signatures Series is another autograph set to chase. Also looking back to '84 for inspiration, Retro Relics contains race-used memorabilia. Collectors will find a pair of relic cards in each box. 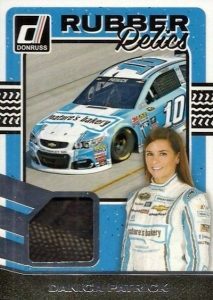 Relying on the popular insert lines of the brand, 2017 Donruss NASCAR Racing adds Race Kings (and Race Queens for Danica Patrick) along with holographic Dominator cards. Elite Series inserts are among the more limited sets. 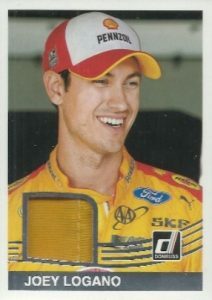 Joey Logano 2017 Donruss 1984 JL Signature Series Autograph !!!!!!!! 181 cards. Shop complete base sets on eBay. PARALLEL CARDS: Gold Foil #/499, Blue Foil #/299, Green Foil #/199, Gold Press Proof #/99, Press Proof #/49, Artist Proof #/25, Printing Plates 1/1. 19 cards. Specific nickname for each driver noted below. PARALLEL CARDS: Holo Gold #/25, Holo Black 1/1. PARALLEL CARDS: Cracked Ice #/999. 5 cards. Serial Numbered #/999. 36 cards. 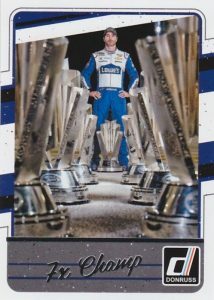 *Kahne, Kenseth found only in parallels. PARALLEL CARDS: Holo Gold #/99 or #/25, Holo Black #/10 or less. 44 cards. 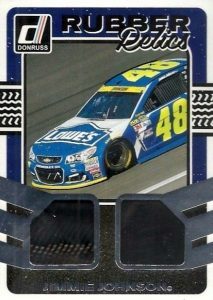 *Jimmie Johnson (#24) found only in parallels. PARALLEL CARDS: Holo Gold #/99 or less, Holo Black #/10 or less. PARALLEL CARDS: Holo Gold #/25, Holo Black 1/1 (*Cards #1, 14 - #/10). PARALLEL CARDS: Holo Gold #/25 to #/22, Holo Black 1/1. PARALLEL CARDS: Holo Gold #/25 (*Card #12 - #/10), Holo Black 1/1.